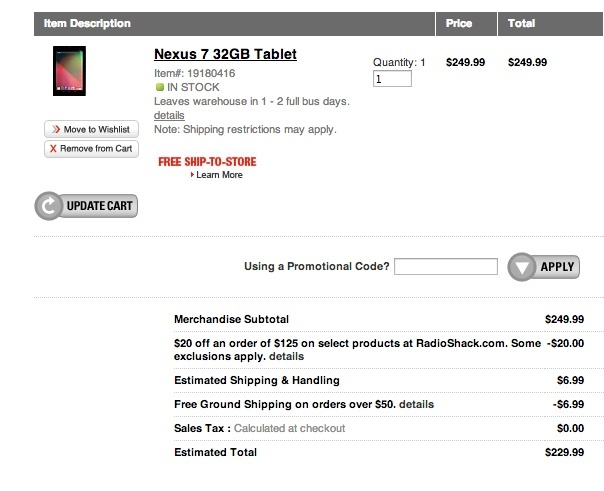 Thanks to coupon code “RARMNJ1320” you can grab a 32GB Nexus 7 from RadioShack for $229.99 along with free shipping. That’s a total savings of 26.99. Keep in mind that Google is currently selling the 32GB version for $249 and will then charge you $14 to have it shipped. So if you compare to what Google is doing, you are actually saving even more money. Once you have added the device to your cart and you head to checkout, you’ll have to type in the entire coupon code, as pasting it doesn’t seem to work. Once applied, you should see the discount immediately (pictured above). If you live near a RadioShack and do not want to wait for it ship, in-store pick-up is free as well.